If you're looking for a way to record your favorite live show online or want to schedule a recording in the future, then Stream Recorder.NET is the perfect free (and open source) tool which allows you to do that with little effort. 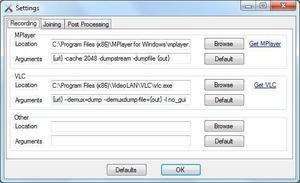 With Stream Recorder.NET, you can record VLC Media Player or MPlayer-compatible streams. Version 1.0.6 is a freeware program which does not have restrictions and it's free so it doesn't cost anything. For security reasons, you should also check out the Stream Recorder.NET download at LO4D.com which includes virus and malware tests. Additional screenshots of this application download may be available, too. Stream Recorder NET download been highly rated by our users.